Australia 7-315 (Michael Clarke 105, George Bailey 82, Boyd Rankin 2-49) beat England 227 (Jos Buttler 75, Kevin Pietersen 60, Eoin Morgan 54, Clint McKay 3-47, Mitchell Johnson 2-36) by 88 runs. Michael Clarke marshalled his troops from the front by plundering a first ODI ton vs. England as the visitors clinched the encounter by a splendid team work. Australia amassed 315 runs for the loss of seven wickets in the measured 50 overs and the innings of England was rolled back for 227 runs with 34 balls to spare. 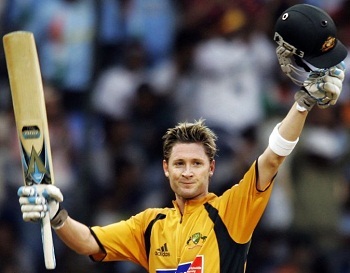 Michael Clarke (Australia) was announced ‘Player of the match’ for his majestic century and brilliant leadership. The first One Day International of the series was washed out in Edgbaston on September 6, 2013. The second match was held at Old Trafford, Manchester, on Sunday, September 8, 2013. Earlier, Eoin Morgan, the captain of England, won the toss and invited the Kangaroos to bat first. Shaun Marsh along with Aaron Finch opened the innings and the first was gone for a duck on the fourth ball of the innings. He was replaced by Shane Watson who hit 5 fours until the end of the 8th over and added another two boundaries in the next one. The score was taken to 60 when Shane Watson was caught behind by Jos Buttler off Ravi Bopara for 38. The skipper of Australia, Michael Clarke, got in next and Finch hit his first four on the 26th ball he faced. The run rate was picked up by the two batsmen and they gathered 13 runs in the 20th over with 1 six and 1 four. Aaron Finch lost his wicket at 116 in 21.5 overs after being caught by Joe Root at long-on at the bowling of James tredwell for 45. George Bailey was the next batsman in and made his intentions clear by hitting a six in the 26th over. Michael Clarke reached his fifty with a four and the duo hit 1 six and 8 fours in the coming overs. Bailey smashed his 7th ODI half century with a grand six over the bowler’s head and accumulated 15 runs with his partner in the 42nd over. Michael Clarke blasted his maiden ODI hundred against England in the 44th over and that was his 8th one in the limited overs game. The fourth wicket produced 155 runs partnership and was dislodged at 271 in 43.3 overs as George Bailey lost his wicket for 82 off just 67 balls with 4 towering sixes and 5 fours. Clarke was caught behind by Buttler off Rankin for 105 from 102 with 14 fours and the Aussies piled up 315 with three wickets still in hand in 50 overs. Steven Finn, Boyd Rankin and Ravi Bopara shared two wickets each whereas James Tredwell got one. The English opener, Kevin Pietersen, found him stranded at one end as the hosts lost three quick wickets for just 38 in 10.2 overs. Michael Carberry, Jonathan Trott and Joe Root went back to the change room for 4, 0 and 3 runs. Eoin Morgan associated next with Pietersen who was batting at 28 runs and they hit 13 runs in the 16th over with 1 six and 1 four. Kevin Pietersen attained his 25th ODI half century in the 18th one but was caught by James Faulkner off Shane Watson for 60 from 66 deliveries with 2 high sixes and 6 fours. The next batsman, Ravi Bopara, was caught and bowled by Adam Voges for just one as Jos Bottler took guards at the pitch. The score board kept on creeping with odd boundaries and Buttler was dropped at 11 in the 29th over. Eoin Morgan survived after he calimed a review at 46 and achieved his 18th ODI fifty in the 32nd one. He was excellently caught by Clarke off Clint McKay for 54 from 69 with 4 fours. Jos Buttler exhibited a solo fight by thrashing 75 off 65 balls with 3 giant sixes and 5 fours as the entire English team was bowled out for 227 in 44.2 overs. Clint McKay was the supreme bowler with three wickets, Mitchell Johnson held two whereas James Faulkner, Adam Voges, Fawad Ahmed and Shane Watson shared one wicket each. Australia triumphed in the second One Day International by a healthy margin of 88 runs and leads the five match series 1-0. The third game will be held on September 11, 2013, at Edgbaston, Birmingham.